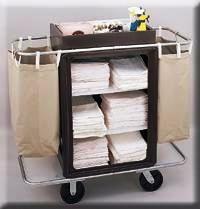 Maid cart is a very effective housekeeping tool as it is capable of carrying large amount of supplies and equipment. Even a room attendant cart or a chamber cart is also can perform as a cleaning equipment by removing and carrying of cleaning materials, soiled linen and garbage. Use of maid cart can reduce the valuable time of a housekeeper as it provides an assurance regarding availability of all guest supplies together. The maid cart or the room attendant cart is usually positioned in the linen room where other housekeeping supplies are also stored. These carts are available in both metal and wood. Check the supplies against the provided checklist before forwarding into room service. To bring hygienic tone and make it appealing, the cart should be cautiously maintained and stored locked. Place the cart along the corridor wall to avoid any collision during cleaning. There must be expansive space in the cart that it able to carry all those supplies which are required by a room attendant in a particular workday. The cart should be easily movable by the maid as it contains large amount of supplies. To make it easily movable a perfect cart would have fixed wheels at one end and castor –wheels at the other. The room maid cart includes three deep shelves, the lower two shelves for stoking linen and the top shelves for stocking supplies. But it is essential to keep the heavier linens on the lowermost shelf and the lighter linens on the top shelf. The cart also contains a bag for collecting soiled linen, removable thrash bags, storing space for a vacuum cleaner and a hand container, a top that is partitioned for amenities, guestroom brochures. If room attendant is not allowed to use floor master keys then the chamber carts may have a locked box to store guestroom keys. 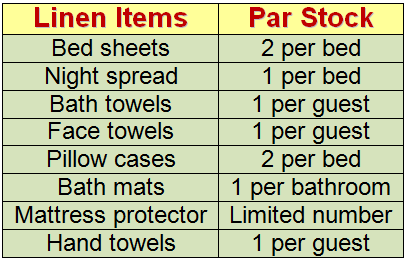 The supplies or the linens in the maid cart should never be overstock or understock as understock often creates scarcity of supplies and overstock could increase the risk of misuse or damaged. Generally all those linen items are stored in upper and middle shelves whereas heavy items like bed sheets or mattress protector are generally stored in the bottom shelf. In times of storing items in maid’s cart lighters items are stored from top to middle and heavy items are in bottom side to adjust the weight. In top portion, different hotel guest supplies like ash trays, sewing kits are kept. For quick cleaning in some carts different cleaning agents used mainly in housekeeping department like room freshener, dettols are kept. Each room attendant will be responsible for each of the items. So these supplies should be used in assigned room only. Placing housekeeping trolley properly in times of cleaning is important. It should be placed beside the corridor in such a way that guests can move easily. Be careful while moving with cart to avoid any unwanted collision. Try to place cart in a way that requires less movement to clean different rooms. The room or the place where the maid cart will be positioned must be dry area and well ventilated. All carts should be thoroughly cleaned and wiped daily. The soiled linen bag and thrash bags that are kept in the maid cart should be emptied at regular basis. The wheels of cart must be well-made and oiled intermittently with expert hand. All the linens and supplies should be properly organized in the cart after each sift that it make easier to replenish extra item. My name is Amin from ethiopia . 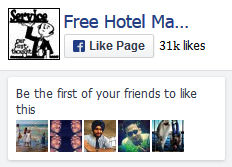 I am a hotel management instructor . Pls i want to know about table set up . Specialy restaurant set up formal and informal set up . I’m an instructor here from the philippines and i find this source of information very significant. I wonder if i can download all these. thanks!